1. Heat oil in a soup pot over medium heat. Sauté the onion and garlic in the oil until onion is soft and golden. Add cumin, coriander, and paprika. Stir and cook until the aromas strengthen. 2. Add chopped spinach to the sauté and cook until it wilts. 3. Add Tabasco, oregano, lentils and stock to the pot. 4. Bring soup to a boil, then reduce to simmer. Cook covered for about 50 min. 5. Add salt, pepper, and tomato paste. Simmer for 10 more minutes. 2. Fill large pot with water and steam sweet potatoes and carrots for 5 min. Add asparagus and steam for another 5 min. 3. Transfer veggies to a large bowl. Add olive oil, tamari, leeks, scallions, dill, and basil. Toss well. Season to taste with pepper. 4. Place 4 large foil sheets on a baking sheet. Spray foil with nonstick spray. 5. Place spinach on each foil sheet and then top with a salmon fillet. Season with pepper. 6. Spoon veggie mixture on sides of salmon. Top with 1 T butter. Wrap foil around salmon and seal. 7. Bake until opaque, about 16 min. 1. Combine walnuts and dates in food processor. Process until well mixed and ground, but not smooth (about 30-40 seconds). Press evenly into a 9 inch tart pan. Refrigerate while making filling. 2. Peel and core apples. Thinly slice apples. Place prepared apples into lemon water while prepping the remaining apples (this step can be omitted). Drain well in colander when done. 3. 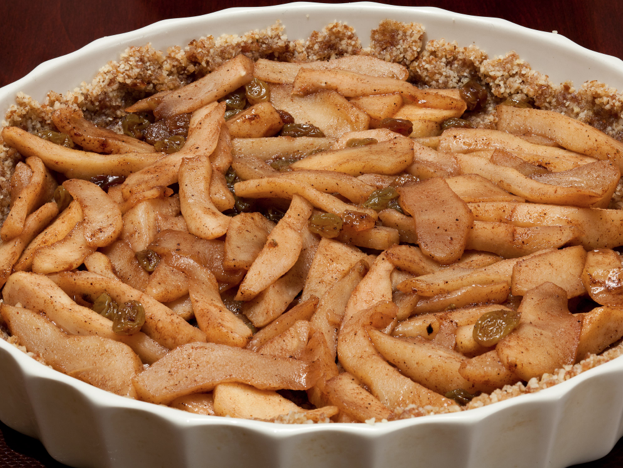 Place apples in a large skillet with remaining ingredients and cook for about 10 min, stirring frequently on medium heat. 4. Remove apples with a slotted spoon into a bowl and cool completely. 5. Reduce liquid to about half the volume and cool slightly. 6. Spread apples evenly over the crust. Brush apple juice-syrup mixture over apples. Refrigerate tart. Can be topped with vanilla yogurt if desired. This soup is low in cholesterol and is a good source of vitamin C, riboflavin, niacin, B6, iron, and potassium. It is also a very good source of vitamin A, K, and folate. The soup has a low glycemic index. This dish is a very good source of B12 and is also a good source of vitamin A, K, niacin, and selenium. 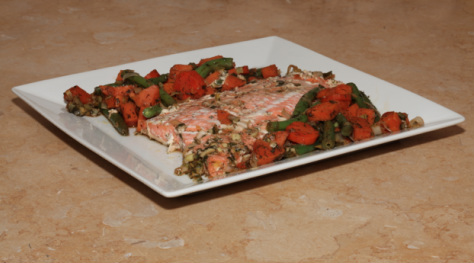 The salmon is also a wonderful source of omega-3 fatty acids. This easy-to-make dessert is a fun way to get the sweetness of apples and honey without too much added sugar. It is very low in cholesterol and sodium but high in manganese. It also has a vegetarian source of omega 3's (walnuts). Be aware that is does have a high amount of natural sugars.